Never mess with a big brown bear, especially big brown bears in Hokkaido known in Japanese as higuma. 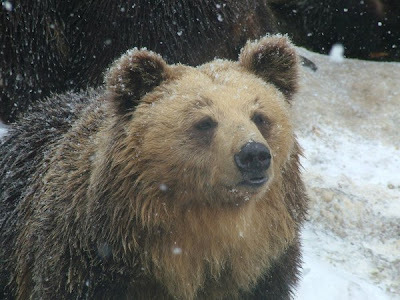 Unlike the bears in Honshu and the rest of Japan, the brown bears in Hokkaido are a different species, as are all of the native mammals on the northern side of the Tsugaru strait (the Blakiston line). Just as the Tsugaru strait separates Hokkaido from the rest of Japan, it has always provided a barrier. The native mammals of Hokkaido are closely related to those of Sakhalin and the Kurile Islands, as these provided the land bridge between the Asian mainland and what is now Hokkaido. The mammals on the southern side of the strait migrated through the southern land bridges, primarily the Korean peninsula, which is why there are Japanese macaques on Honshu as far north as Aomori, but none in Matsumae or the rest of Hokkaido. Sakhalin Island currently has an estimated population of about 1,400 brown bears, and it is less than 10 kilometers (16 miles) from the Asian mainland (part of the Russian Far East) at its closest point. It is probable that migrant individual bears cross from the mainland to Sakhalin occasionally across the ice, however hunting in Sakhalin has drastically reduced the bear population. As the sea gap between Sakhalin and Hokkaido is some 40 kilometers (you can sometimes see the southern tip of Sakhalin from Wakkanai in clear weather), there have probably been no immigrant bears since the last major glaciation. Hokkaido covers 77,000 square kilometers (it is approximately the size of Ireland), and is believed to support about 3,000 bears in wild habitat. The current population is much lower than historical levels due to hunting and loss of habitat, and the current population of bears is fragmented due to habitat loss and other human constructions such as the transport infrastructure and extensive urban sprawl in areas such as Sapporo, Otaru and Asahikawa.